Many interesting opinions were shared and while I understood some of the posts shared, the others left me riddled. 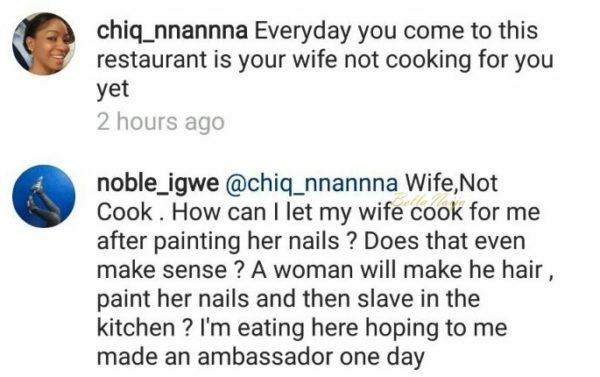 One person tweeted that she will only cook for her husband only if he is worth it. I am not even about to make this a big deal but I really fear that our fight for equality of both sexes is being washed down by such debates as this. Women have no doubt been cheated over the years but making everything out like a battle isn’t the way to go about things. Women have been known to be naturals at house keeping while the men have been known to be the breadwinner of the house. A lot of that has changed,hence the hashtag. My two cents however, would be that marriage, which is the case in point here, is peculiar. It is built on compromise and no two marriages are entirely alike. What this means is that with great communication and understanding, no one has to feel compelled to follow a set of rules. Mutual respect is what is key for a relationship to survive. Do not be bent on playing mind games with your partner, understanding one’s spouse is the most important thing. We get married in order to support each other. This means when one of the parties involved is weak where the other is strong, then the stronger one should help. We should treat our partners with consideration and kindness while we allow room for growth. It isn't right for every thing from' who takes the trash out' to who pays the bill to be decided by public opinions. Find out whatever works for you as a couple and stick to it because no two relationships are alike and what works for A might not necessarily work for B . While hashtags might have become a major feature of the social media, it doesn’t necessarily present the solution to marital issues. If you are a man and you are a good cook, by all means cook and if as a woman you can’t cook, there is no harm in learning. Marriage is for both people involved to become better versions of themselves.